April 27, 2016 — The road in front of us was dusty, the hills surrounding us shades of beige and brown. The desert, man. But it wasn’t too bad. January’s a good time to be in the desert. And I was excited. We were pulling into my first Old West ghost town. I mean, to this point I’ve seen more ghost towns than a guy who makes a living sitting in front of a computer should have, but they’ve been mostly clumps of stone cellars or ramshackle wooden buildings in forests. You know, East Coast ghost towns. This ghost town was out in the desert of Nevada, dry and cracked, like a carcass left out for vultures and exactly the experience I was looking for. 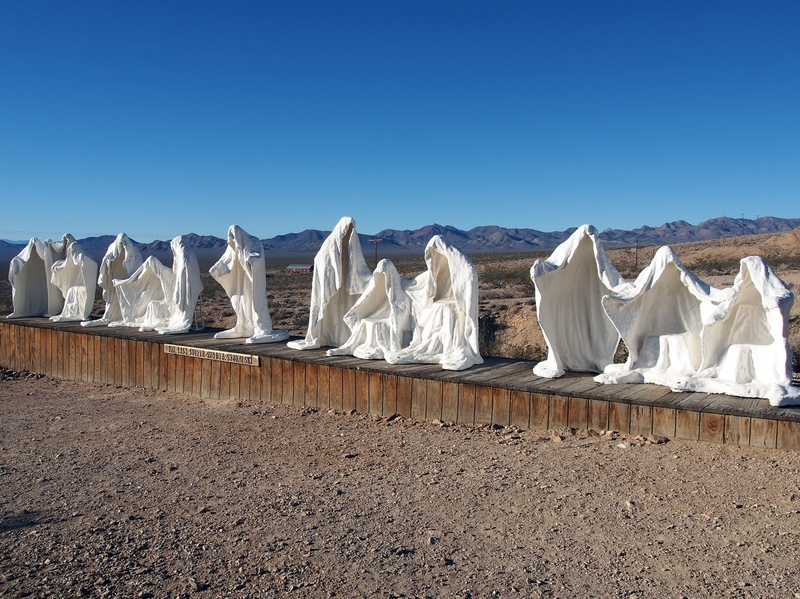 Except for the sheet ghosts and giant naked Lego woman, of course. Rhyolite is an igneous, volcanic rock, of felsic (silica-rich) composition (typically > 69% SiO2—see the TAS classification)…wait. Ripping off the wrong Wikipedia article. 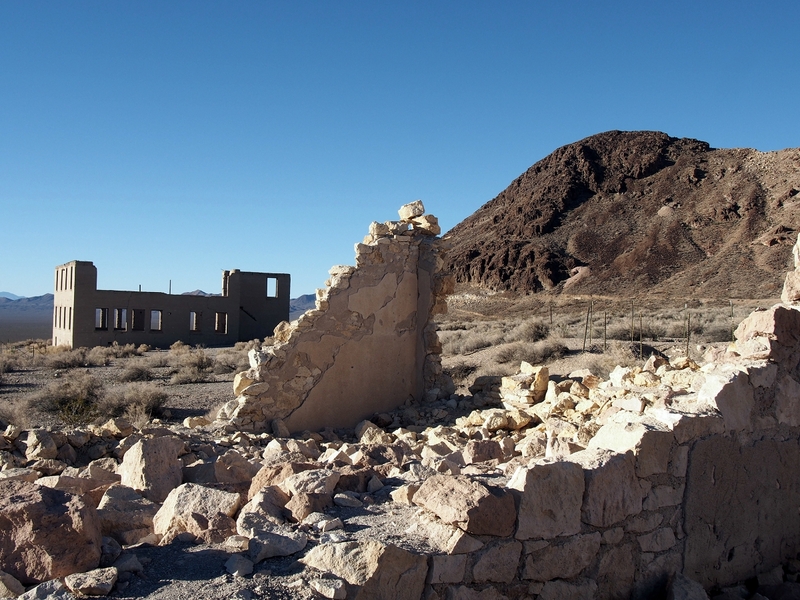 The town of Rhyolite, Nevada, which was named after the rock, was settled in 1902. So not the oldest of wests—really the tail end of that period—but, still, it was a Gold Rush town. Rhyolite’s in the Bullfrog Hills, a couple of hours northwest of Las Vegas, and right on the edge of Death Valley. 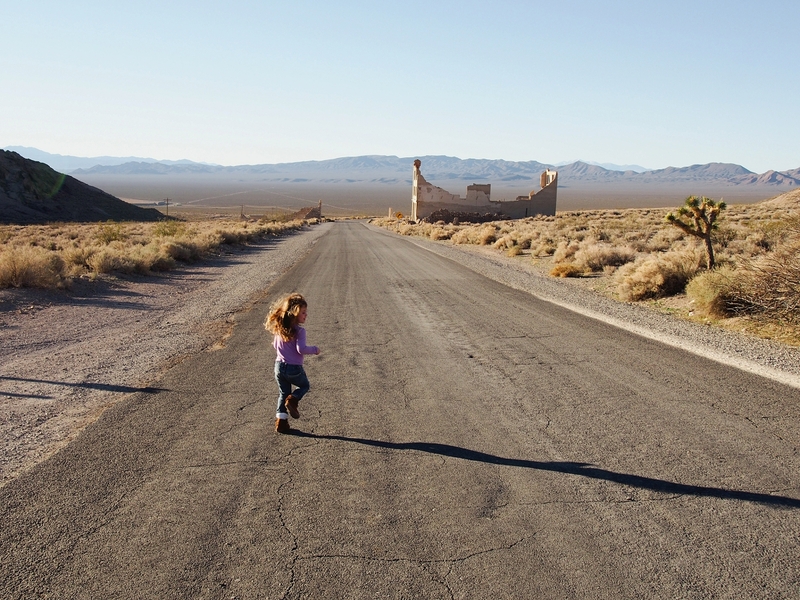 Five miles west, and this place would be a California ghost town. As we drove in, the road sloped upward. We passed about half a dozen buildings, some no more than facades, others as crumbled as ancient Roman ruins, until we reached the top and parked. Nobody was around. It was a literal and figurative ghost town. So we ran down the road darting in and out of buildings in wild abandon because, you know, ghost town. 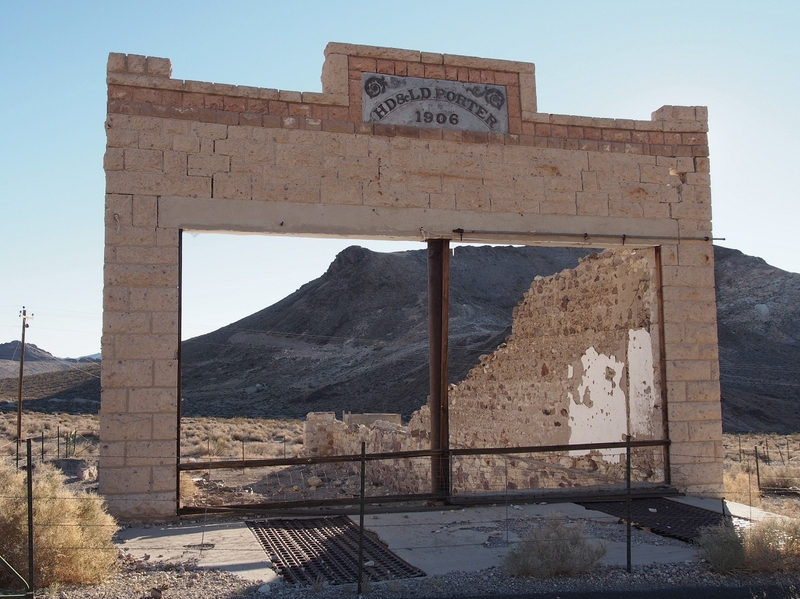 Rhyolite started as a mining camp after gold was found in the Bullfrog Hills, which were named for the mottled green color of the rock that they were excavating. Mining soon started in earnest, and a few towns cropped up in the vicinity. Rhyolite was by far the biggest because it was near the largest and most promising rock tunnel, the Montgomery Shoshone Mine. After the initial rush, the town quickly became legit. At its peak, as many as 5,000 lived here. 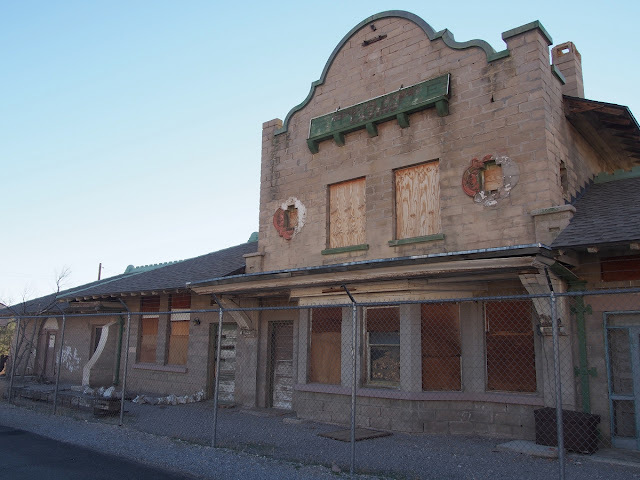 It had banks and saloons and brothels and everything you want out of an Old West town minus Don Knots in a black cowboy hat with a silver-spangled brim. Then the mine dusted. It wasn’t as rich a source for gold as had been hoped. The big mine finally winked closed in 1911, but by then the population had already dwindled to about 500. By 1916, the town was only such by the slimmest definition of one, and by 1920, it only had one resident, a 92-year-old codger whom I assume had some serious stories. In the following decades, many of the buildings decayed into oblivion or were torn down for materials. One wooden shop made it to 2014 before it was hit by lightning and burned own. Movies were filmed here as well, the 1987 Chery 2000 and 1998 Six-Gun Samurai, being the two I’ve seen from the list because I minored in late-century post-apocalyptic science fiction. 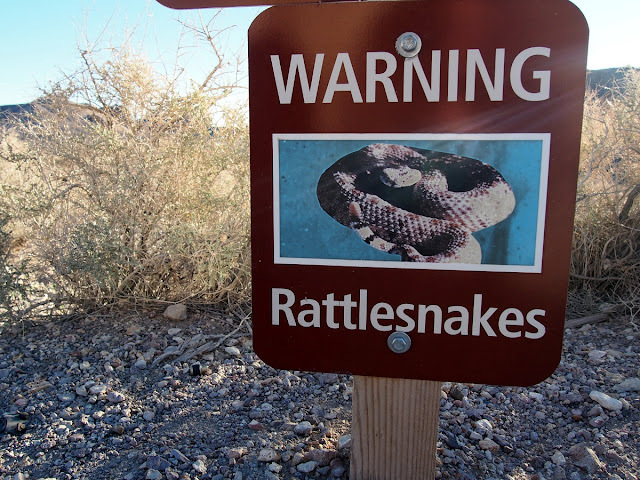 Various signs were staked into the side of the road, mostly informational placards, but one or two Beware of Rattlers signs, too. The desert, man. The informational placards explained what each building used to be and included photos of them before they ghosted. At the top of the rise, where we parked, was one of the best-preserved buildings. It was originally a train station, but after the trains stopped coming, it was converted to a casino. It was boarded up and fenced off. Looked like an abandoned Mexican-themed chain eatery. Further down the road were the remains of a jewelry shop, a school, a general store, a jail, a couple of banks. Some were protected by fences, and others we could walk right through the doorways, pushing invisible swinging saloon doors as we went. Some of the graffiti had been around almost long enough to rank as historical. 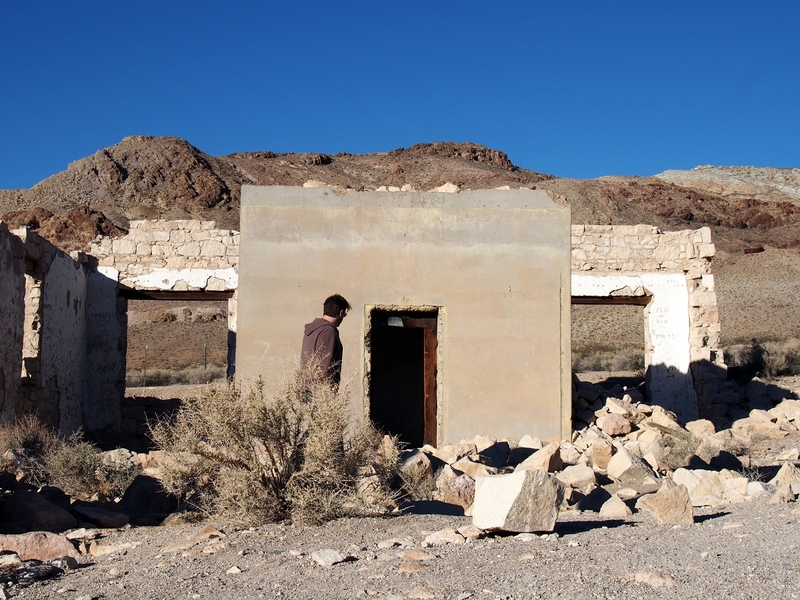 The last building on that stretch of road was an odd one, even for a ghost town. 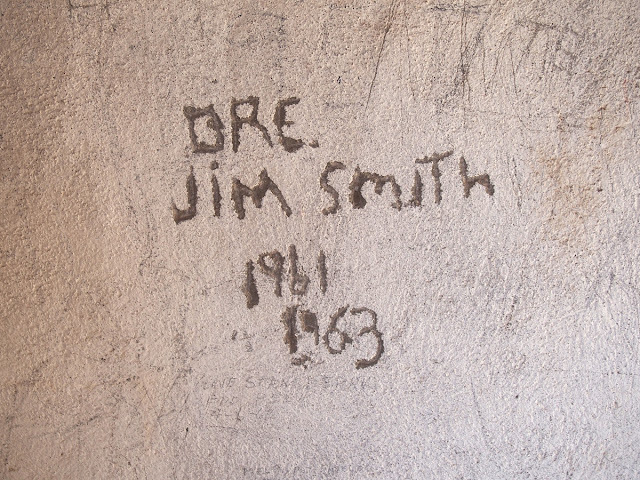 Its walls were polka-dotted with the butts of glass bottles, some 50,000 of them. 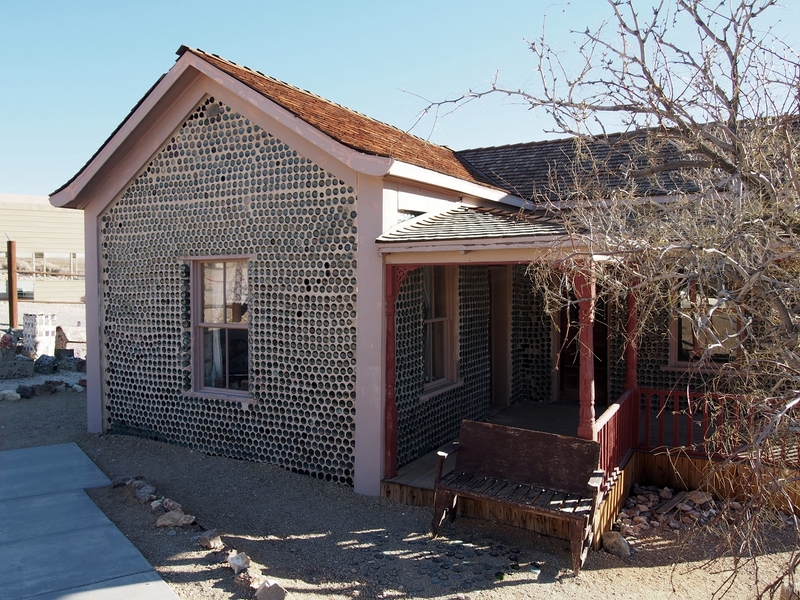 The house made of glass bottles was built by a miner named Tom Kelly in 1906, and was restored sometime here in the 21st century. In front of the house was a model of the town made of mortar and broken glass of various colors. The house looked like an art installation, but that was probably more because it was almost in the middle of one. At the base of hill there is the Goldwell Open Air Museum. 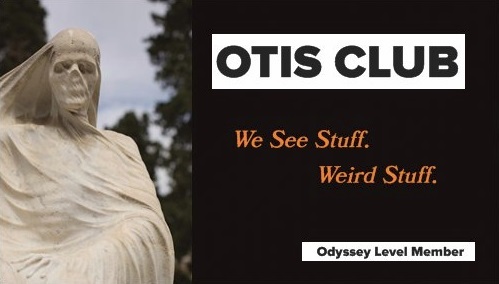 That’s where the sheet ghosts and naked Lego woman enter the story. Some of the installations dated to the 1980s, Like Albert Szukalski’s The Last Supper, a line of the aforementioned ghost-like plaster forms, as well as Ghost Rider, another ghost-like plaster form, this time about to hop on a rusty bicycle. 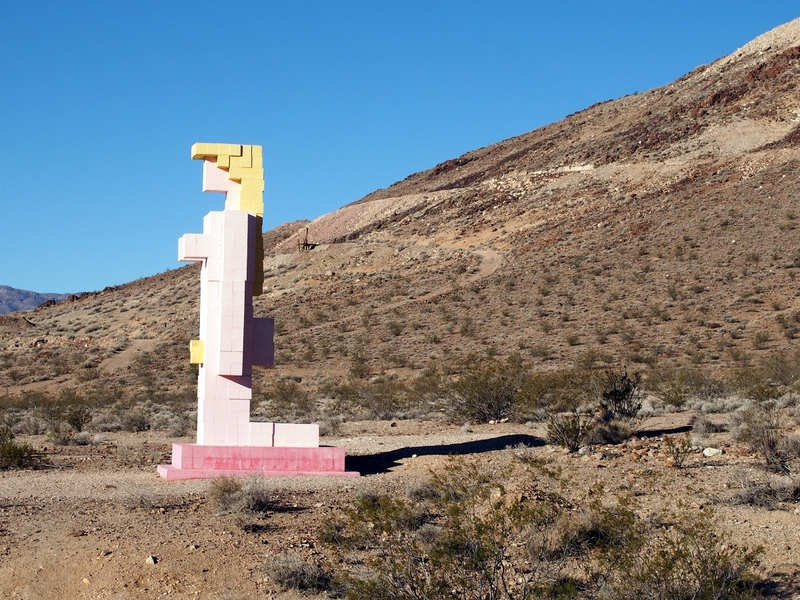 The giant Lego woman (Lady Desert: The Venus of Nevada) was actually a giant cinder block woman. She was erected in the 1990s by Hugo Heyrman. 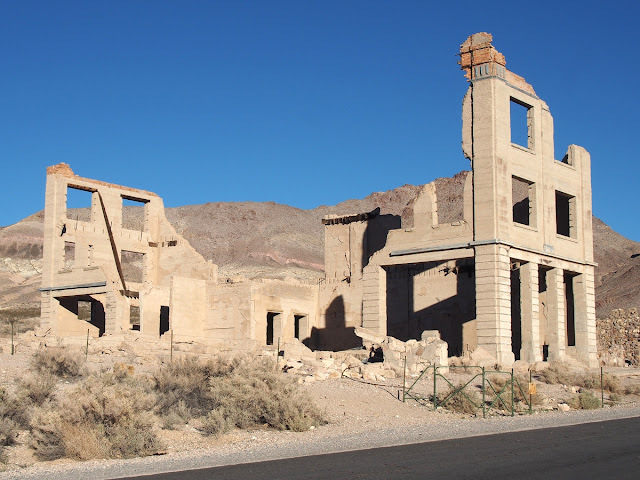 There was also an indoor museum/gift shop showcasing photos of Rhyolite from back when the town bustled with more than rattlesnakes, but it was closed on our visit. You can see some of those types of photos here, including this great before and after shot of the town. Hangin’ out with strange art is about where we lost that spooky ghost town vibe, so we tried to get it back by searching for Rhyolite’s cemetery. 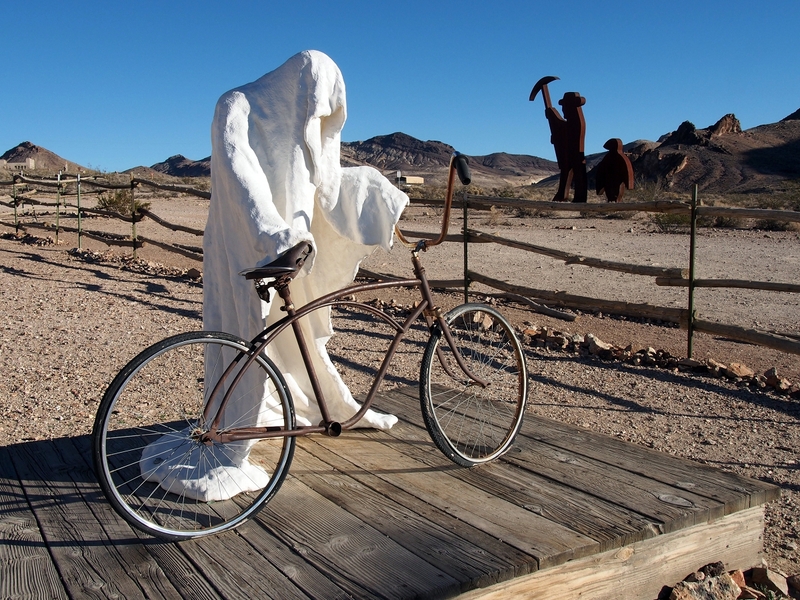 It’s called Bullfrog-Rhyolite Cemetery, since it was shared by two towns, and it’s about half a mile east of Rhyolite. 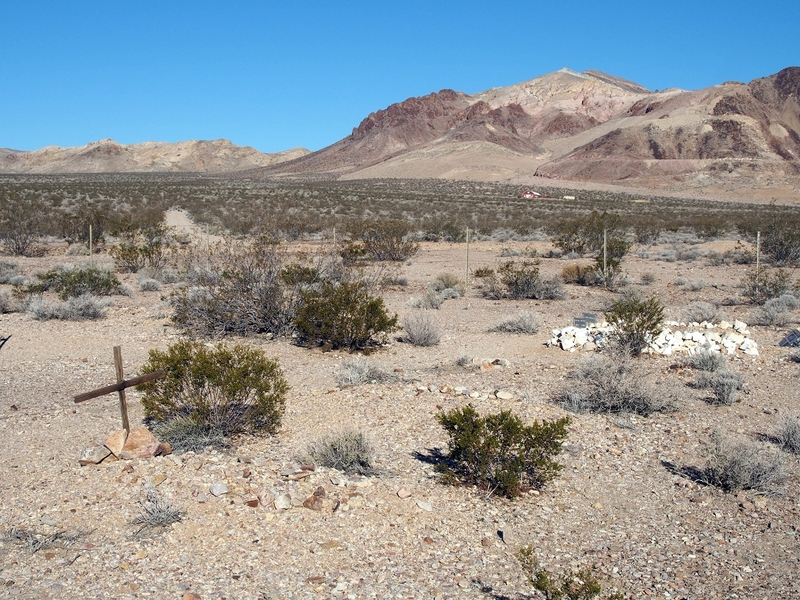 We drove down an old dirt road that cut through some sage brush, and even then didn’t see the cemetery until we were on top of it. It only had a few stone grave markers, one of which commemorated the final resting place of a woman named Bessie L. Moffat, who was born in 1881 and died in 1986. She missed the debut of Cherry 2000 by just a year. 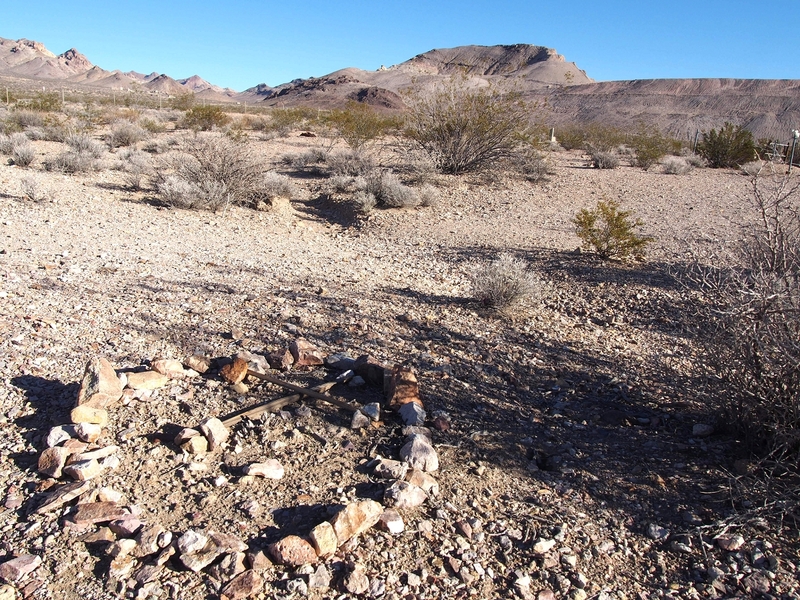 The rest of the graves were humps of human-sized dirt or circles of rocks. A couple had wooden markers. Standing in that graveyard was a real moment, of the type I don’t always get and usually just pretend to have so I can end articles better. I mean, here I was, a suburban, East Coast, colonial-history-steeped guy standing in a century-old graveyard full of sage brush and Gold Rush miners, looking out at desert hills that nestled a fading ghost town. I walked bow-legged out of that cemetery and yelled “Giddyup!” when I turned the key in the ignition to drive off into an imagined sunset.